Best thing about these is the quality and design. Looks perfect in my craftsman home. Have the set spread in several rooms and my guest bathroom. Also run an Airbnb. Guests all love them for their visits here! 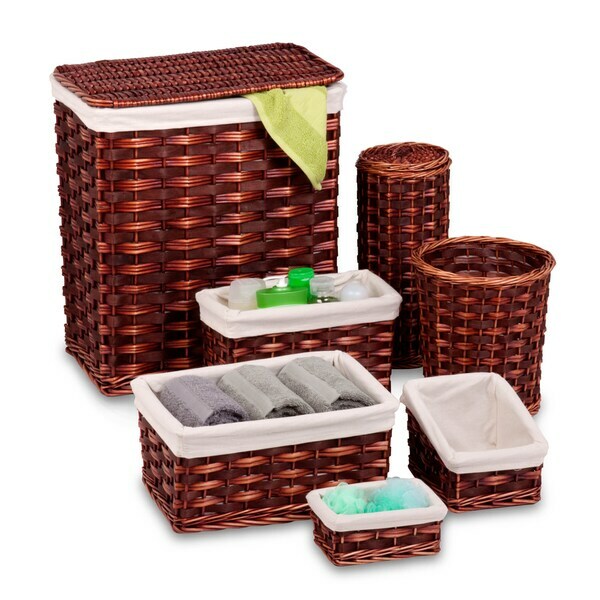 Add a new look to your bathroom decor with this 7-piece Wicker Hamper and Bath Set. This well-made set creates a coordinated, polished look in any bathroom. Included in the set is a full size hamper with liner, toilet roll holder, wastebasket, and four multi purpose bins. The bins look great in any room and doubles as decorative baskets as well as great storage pieces. While the price was right I was not impressed with the quality of this product. The waste basket was flimsy to me and will not hold up well in the future. The hamper is ok but did not like the lid being so loose fitting. This was a very wise purchase. The hamper is decent. I love the waste basket and toilet paper holder. I use every piece except the one depicted showing towels in it as counter top storage and it has really helped me organize. The taller one I put stuff I use often in it like my makeup removers. It's also big enough to fit my hair dryer. The slanted one I use for my most-used cosmetics, like my favorite blush and eye shadow pallet. The smallest one I use for "hair fixies" like pony tail holders and small clips. I'm not a very organized person by nature, so this really helped clean up the sink area. I don't know what I'm going to do with the largest one, but I'm sure I'll find a good use for it. A good hamper and combo. The liner is a must because the wicker will snag your clothes. I didn't need the other pieces and just bought it for the hammer and waste can. Very attractive lightweight set of wicker baskets. The sizes were interesting and useful. I have had this set for a year now and it is still holding up. I love the color and all the baskets for toiletries, etc. I have been able to make good use of all of the pieces. Helped neaten up my bathroom! I have a small bathroom with a cupboard that is open, so this set really helped to make it look less clutter-free. I purchased the chocolate color which compliments the other wood very well. These baskets are very cheap and break apart. Ours arrived with most bent from the way they were packaged - when trying to bend them back they break and crack. I would not recommend this to others. This was what I was expecting. Good quality and an affordable prize. I like the quality and finishing of the product. "Ditto. What are the hamper dimensions?" The hamper is 18.5 inches long by 12 inches wide by 22 inches high. Thank you for your interest. The dimensions are 18.5 inches long x 12 inches wide x 22 inches high. Please feel free to contact us again with any further questions. Since dorms are known for close-quarters living, making smart furniture and organization choices can greatly improve the comfort and function of your space. Check out these six tips to improve any dorm room experience.